Chinese EB-5 applicants may soon be subject to a wait list, according to a prediction in the U.S. State Department’s December 2012 Visa Bulletin. There is an annual worldwide quota of 10,000 EB-5 immigrants. There has never been an EB-5 wait list before. But in fiscal year 2012 (ending October 31), a total of 7631 persons immigrated in this category, of which some 80% were from China. With continued growth in demand, the worldwide quota could be reached. The general rule is that nationals of any single country can only receive 7% of the visa numbers in a particular category. But there are several exceptions. One is that if the worldwide quota for the category has not been reached then unused numbers “fall across” to the oversubscribed country. That’s how Chinese nationals have been able to receive so many visa numbers. However, if–as the State Department predicts is possible–the worldwide quota is reached, then fewer numbers will “fall across” to China, creating a wait list. Prospective investors would need to be aware that they need to commit their funds (e.g., put funds in escrow or actually invest them) upon filing the I-526 but would not be able to immigrate until an immigrant visa number is immediately available. Investors with approved I-526s would not be able to file an immigrant visa application or Form I-485, Application to Adjust Status, until an immigrant visa number is immediately available. Investors with pending I-485s would not be eligible for approval until an immigrant visa number is immediately available. The wait list could also impact EB-5 regional centers’ marketing strategies, requiring more focus on investors of other nationalities. The following advisory is based strictly on the current demand situation. Since demand patterns can (and sometimes do) change over time, this should be considered a worst case scenario at this point. It appears likely that a cut-off date will need to be established for the China Employment Fifth preference category at some point during second half of fiscal year 2013 [i.e., April to September 2013]. Such action would be delayed as long as possible, since while number use may be excessive over a 1 to 5 month period, it could average out to an acceptable level over a longer (e.g., 4 to 9 month) period. This would be the first time a cut-off date has been established in this category, which is why readers are being provided with the maximum amount of advance notice regarding the possibility. The above projection[ ] [is] for what could happen during … the next few months based on current applicant demand patterns. The determination of the actual monthly cut-off dates is subject to fluctuations in applicant demand and a number of other variables which can change at any time. 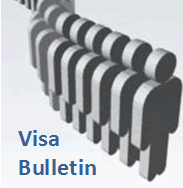 For background, see our article, How to Read the State Department Visa Bulletin. If you want to venture any prediction for when the wait list will appear, what the cut-off date will be, or how long the EB-5 China wait will be, add it to the comments.